I’m pleased to announce that the LyricWiki iPhone app has finally hit the App Store! 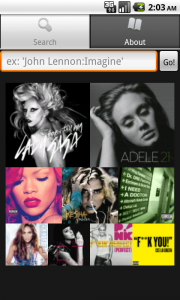 If you have an Android device, visit you can grab the LyricWiki Android app which made it out first. Now that the iOS version is complete, here we cover most smartphone users in the US. It’s been a long road (including the month-long submission process through Apple), but this version feels pretty solid. Powered by a wiki community – constantly updated! These lyrics have had 5 years of review and editing from hundreds of thousands of users! This is the single most accurate lyrics collection anywhere. I’d also like to give a shout-out to all of the beta-testers and other users who have given feedback about the app… it’s extremely helpful to know what the community wants out of the app. Thank you! Obviously, it’s never “done” & we’ll keep improving it as we go. If you have any feedback on the app, please let me know in the comments! Another cool thing about the app is that, thanks to the help of a number of awesome translators, the app is available in these languages: English, German, Spanish, French, Italian, Polish, Finnish, Swedish, Norwegian, Czech, Dutch, Interlingua, Luxembourgish, Telugu, Macedonian, Breton, and Malay!